“–What do we know of the man? Absolutely nothing. We don’t have an inkling of his past. That could be an asset. A man’s past cripples him. His background turns into a swamp and invites scrutinity. – I like to watch” (Being There). This year marks the fifth anniversary of Gezi Park protests in Turkey. Looking back at these five years, it could be argued that the protests have had a transformative effect over Istanbul, its citizens and especially over the neighborhood of Taksim, where Gezi Park is. The protests made many people question their relationship to Istanbul and the ways in which their engagement with the city and its citizens could be improved. One of the performance protests that stood out—pun intended—was attributed the title ‘standing man’ by the audience of the performance, where a man stood silently in Taksim Square, near Gezi Park for eight hours, right after the police evacuated the park and closed it to public. This paper aims to take a closer look at the ‘standing man’ through the concepts of participation, engagement and site-specificity in order to get a better understanding of the transformative potential of this performance. 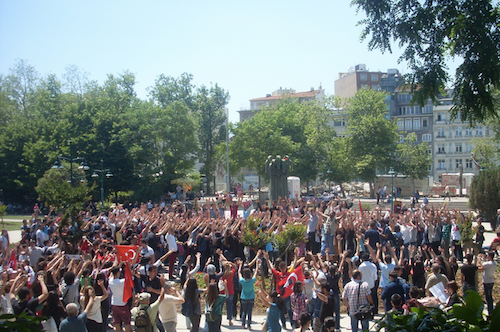 Firstly, let us have a brief introduction to Gezi Park protests. In the summer of 2013, a small group of environmentalists—around fifty people—camped out at Istanbul’s Gezi Park in order to prevent its destruction. It was decided by the government that the park would be replaced by a giant shopping mall, and the decision was followed by bulldozers that appeared at the park around midnight in order to destroy it quietly over night. When the environmentalist group was met with police brutality and violence, the protests turned into a two month long uprising and spread all over Turkey. Ironically, what ended the protests was the same thing that started them in the first place. The police evacuated Gezi Park and closed it to public. That evening, a man was spotted, standing right outside the park, without doing anything else. He stood there silently for eight hours. When others realized that this was a form of protest, many people joined and started standing silently around him, others recreated it in different cities all over the world in the following days. 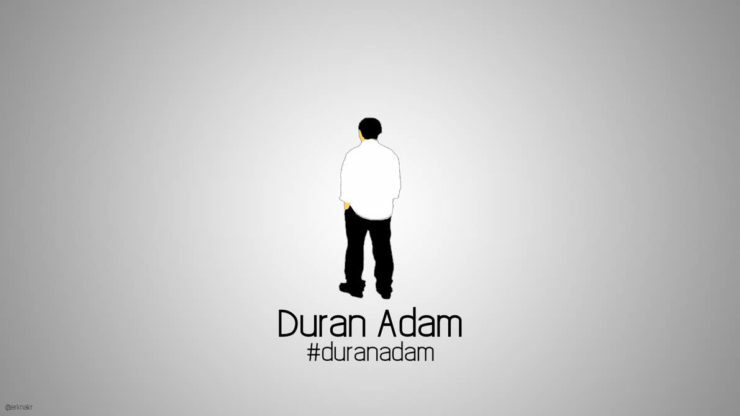 He got viral instantly, catching the attention of international media and also got trending on twitter as #duranadam, Turkish for standing man. In an interview, the standing man, who is a performance artist named Erdem Gündüz, explained the reason behind his performance as: “I went there to show that the protests were not over. There is one man standing here, so the protests are not over” (Mee, 76). Gündüz’s answer shows the impromptu aspect of his performance and how it was very much related to a specific place and a specific time. He didn’t plan the performance beforehand, but acted upon an impulse. At this moment, it could be useful to describe the tensions regarding Gezi Park protests that day. After the evacuation of the park, police stopped all the related protests across the city either through arrests or through scaring off the demonstrators. It was at that moment that the protests were moved to social media from the streets of Istanbul. There was a sense of defeat on social media as the demonstrators “lost” the park to the police and they also started losing hope. There were a few suggestions on how to continue the protests but they couldn’t agree on a specific method. Since five people were killed during the protests and hundreds were injured, many demonstrators wanted the protests to end before more people were hurt as well. It was as if it was impossible for people to agree on something once they were out of the park. Their social, cultural and ideological differences were more visible on social media and it kept them from reaching a collective decision. This phenomenon could be explained with the idea of affect space. In his article “Affect Space: Witnessing the Movement(s) of the Squares”, Eric Kluitenberg looks at the connectivity aspect of the protests in squares through Brian Massumi’s understanding of the term affect. He defines affect as “a directly embodied nonconscious intensity” (6) which moves much quicker than our conscious perception and therefore happens before it. As a reason, affect lacks a semantic structure which makes it create a “semantic openness” (6), that Kluitenberg sees as a key characteristic to these protests. Therefore, things that appear to be separate are connected through affect in the moment. Kluitenberg explains this phenomenon as follows: “the semantic openness of the affective link between protestors is a key factor in overcoming a vast array of ideological, material, cultural and political differences” (8). The demonstrators are connected through the environment in the moment and they share and take part in a nonconscious intensity that lets them leave their differences aside. It is important to keep in mind that this is not a conscious decision of having a common purpose, quite differently a more natural way of coming together and sharing a moment. Gezi Protests didn’t have a common goal in the end, even though it started off as a way of protecting the park. It was more like a gathering of people sharing their opposition to the way things are. There were many people and groups who would never come together elsewhere, as well as people who were just there to enjoy the event and participate in the co-operative activities. For a couple of weeks, people in Gezi Park started an alternative community where money wasn’t allowed. Everybody helped in the way they can and the backgrounds were never questioned. As argued above, these differences started becoming visible right after the evacuation of Gezi Park. The standing man appeared in the midst of these conflicts, as a neutral figure who was just standing by himself. His silence restrained people from linking him to a certain ideology. People weren’t even sure that this was a protest until a certain point. He was standing still at a moment, similarly to all of the demonstrators were also motionless, either because they were afraid of moving or because they couldn’t decide on how to move. He was silent, just like Taksim Square and Gezi Park was silent after the evacuation. After a couple of hours, people came to the conclusion that he was resisting against the police brutality, the evacuation of the park and the violence that occurred during the demonstrations. He became the symbol of passive resistance in Turkey and inspired others with his presence in Taksim Square. He showed that standing still could be a political act depending on the context and the location. Looking at this performance brings to mind the concept of the flash mob as they are similar from many aspects. Let us take a look at those similarities in order to have a better understanding of the nature and the functionality of the performance. In her article “From social network to urban intervention: On the scenographies of flash mobs and urban swarms”, Thea Brejzek argues that “The urban scenographies created and inhabited by flash mobs are participatory, temporary and ephemeral” (109). These concepts also apply to the ‘standing man’ performance. It was also temporary and ephemeral as it lasted only eight hours and wasn’t permanent in any way. It was participatory as it allowed people to engage with the performance, join it and even recreate in their own way. For instance, some people chose to engage with the performance by leaving some snacks and water near him, in order to help him to stay there longer. It was also accessible, since it was free of charge, didn’t require tickets and was happening in a square in the city center. Another aspect that is remarkable about the performance is that it managed to go uninterrupted. Even though there were many people who engaged with the performance or tried to talk to him, no one tried to make him leave or stop him from performing, including the police. The police tried to ask him questions and searched him, his backpack and eventually left, as they couldn’t find anything violent or harmful about his protest. “[T]o open up public space to alternative uses and to refract the existing axis of viewing. By staging public space, urban interventionist scenography carries the potential to highlight spatial politics and to communicate social agency” (110). As Brejzek argues above, urban interventions aim to show the different uses of a public space and change people’s perspectives about that place. She explains how the public space, draws attention to spatial politics through becoming a stage. It is true that Gündüz’s performance doesn’t have much of an action, moves or a choreography. But it turns Taksim Square into a stage, or takes advantage of the fact that it could have been seen as a stage that time, since the performance happens at a moment when the square was being watched by millions of people. He becomes the actor on the stage as he shifts the attention from the police surrounding the area, to himself. Does he introduce an alternative way of using the square? Not really, but instead he shows how a simple action such as standing could be considered a form of protest or a performance when the right to do it is taken away from you. The standing man makes people question what is alternative and how quickly it could change. He stands—one of the most mundane acts—in a square where usually millions of people stand every day and transforms it into a special, noble act which is worth documenting and newsworthy. He contributes to the space by using and underlining its defamiliarization. What defamiliarized in the first place is the order to evacuate one of the most crowded squares in Istanbul and replace it with hundreds of police officers. The standing man appears in the moment when Taksim Square was the most quiet and emptiest it has ever been. As more and more people interact with him, the place gets more crowded and filled with citizens. As argued by Mouffe, the standing man’s artistic activism makes the state’s repressive politics visible and opposes them in a way the police doesn’t know how to react to. His intervention is political in the way it is situated. His presence is an intervention to the oppressive forces that are trying to control and discipline the city and its citizens. He resists using his presence and rights as a citizen and manages to create a performance that is inspiring, powerful and solid. The standing man proves how hope could be restored in the city, just by being there and how even the simplest acts are needed at certain conditions where basic rights are taken away from you. Click here to show or hide the bibliography. Ashby, Hal, director. Being There. Twentieth Century Fox, 1979. Brejzek, Thea. “From Social Network to Urban Intervention: On the Scenographies of Flash Mobs and Urban Swarms.” International Journal of Performance Arts and Digital Media, vol. 6, no. 1, 2014, pp. 109-122. Gündüz, Erdem. Interview by Erin B. Mee. “Standing Man and the Impromptu Performance of Hope: An Interview with Erdem Gündüz.” The Drama Review, vol. 58, no. 3, 2014, pp. 69-83. Kluitenberg, Eric. “Affect Space- Witnessing the Movement(s) of the Squares.” open! Platform for Art,Culture and the Public Domain, 10 Mar. 2015, https://www.onlineopen.org/affect-space. Accessed 7 Jun 2018. Mouffe, Chantal. “Artistic Activism and Agonistic Spaces.” Art and Research Journal, vol. 1, no. 2, 2007, pp. 1-5.